Dale Woolsey is a great husband, father and friend. He has two children and has been married to his wife Cathy for 30 years. He has always been adventurous and has survived many near death experiences. He has survived being shot by an arrow, cowboys and Indians where his brother scalped him with a sickle, air borne Special Forces, and bull riding. Dale has had some amazing horses and rides throughout the years. 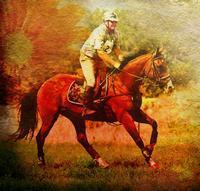 Dale has competed in the sport of eventing for the past 15 years. He has done Novice thru Intermediate and has loved every minute. He loves anything to do with horses and they are the love of his life!!! He loves the outdoors and going packing into the wilderness area’s on his horses with his friends. Being around Dale is an adventure and you never know what to expect. In June of 2012 he was breaking a young colt and it took off on him, and ran Dale into a tree. He was able to stay on but was thrown when the horse jumped a small river and landed face down in the river. Our nephew and brother-in-law were riding with him and they were able to revive him and took him to the emergency room. He had sustained a grade 3 concussion, bruises and contusions whip lash, and damage to his kidneys. Dale had bad kidneys for a while and unfortunately the horse riding accident knocked them down to 17% functioning. As a result Dale started dialysis in December. We have met with the transplant team, and we just got the exiting news that they have accepted Dale and we can now start the evaluation. They figure 3-6 months. YEA!!! His older brother is giving Dale the gift of life and has started the process for being his donor. Although Dale has medical insurance he will face many expenses that are not covered. To help with this financial burden, Dale may apply to receive assistance from the HelpHOPELive Southwest Kidney Transplant Regional Restricted Fund. HelpHOPELive is a nonprofit organization that has been assisting the transplant and catastrophic communities for 30 years. All contributions are tax deductible, the property of HelpHOPELive, and are administered by HelpHOPELive exclusively for transplant-related expenses only. Your contribution is greatly appreciated.Please help Dale through this tough journey so he may ride again. We appreciate your help. Our sincere thanks and deep appreciation go out to you. We would like to thank all who have supported us this past year. Dale is doing great. He got his transplant on May 21, 2013. His older brother was his donor. He is now back to work, and riding his horses. We have been so very blessed this past year. With out all the love and support I’m sure we would not have gotten through it. Thanks to everyone!!!!! Dale, We will help you reach your goal. The committee (your committee) is working on several ideas to raise money. You will get there, my friend!